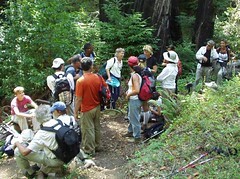 Here we are among the redwoods on the Interpretive Trail in Big Creek Reserve. I so appreciated how easily we came together during the week. The human element of the workshop was as powerful as the wilderness element. It is always fun to see how each group comes together and who we choose to be. We let ourselves be touched by each other and by the natural wild beauty of Big Sur.